Bikini Villa is simply cozy. An open floor plan allows you to see all your guests relaxing, and the rooms seamlessly blend with the outdoor area to really incorporate the space. It’s chic, yet simple. I love this villa for a family getaway or trip with friends. 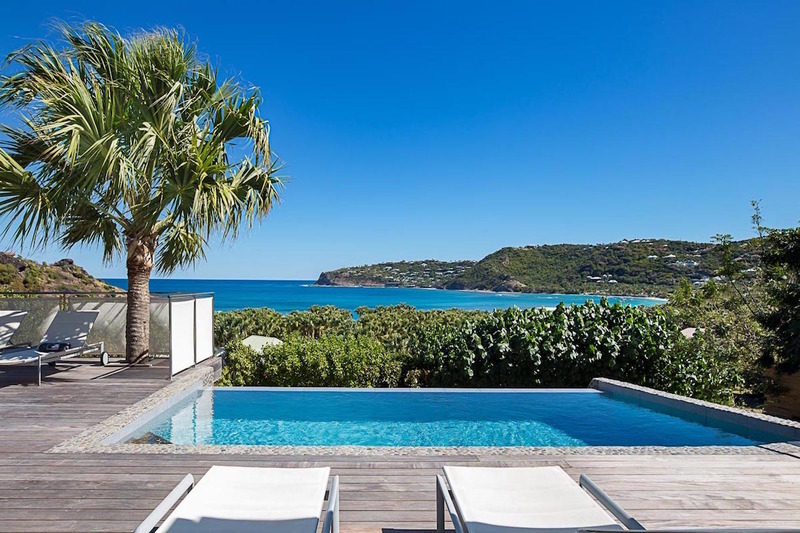 Overlooking lovely Lorient Bay in St. Barts, the Villa Bikini is a wonderful find. A three-bedroom property, it is surrounded by verdant and lush growth that ensures you enjoy complete privacy even as you also savor panoramic views of the landscape around you. Of course, the beautifully landscaped grounds may hold your attention at all times as it is dotted with native palms and many shady and scenic niches. The pool terrace and gardens sit at the front of the villa. The private infinity edge pool is surrounded by shaded loungers on the sun deck and the pergola. The al fresco dining pavilion is nearby, and all of these spaces open into the spacious and elegant interiors. An outdoor living area sits beyond the pool, with ample seating and an ocean view. From the barbecue area and al fresco dining room you enter the formal dining room and the oversized, gourmet kitchen. The open living area blends with the dining area and kitchen to create a cohesive great room. The living area features a cozy sectional and flat screen TV. The dining table seats 6, and the fully equipped kitchen has modern appliances and a breakfast bar/prep surface. This entire area opens to the pool deck, and has modern, minimalist decor. The fully-equipped kitchen has the latest appliances. The immense lounge has a banquette sofa and premium entertainment system for late night movies or hours of lounging. Each of the three bedrooms in the villa are king suites with access to the pool area, great views, and large, private baths. They are also equipped with high-end entertainment systems. Complimentary meet and greet at the airport - every guest will be met at the airport, guided to the villa and given a villa orientation.